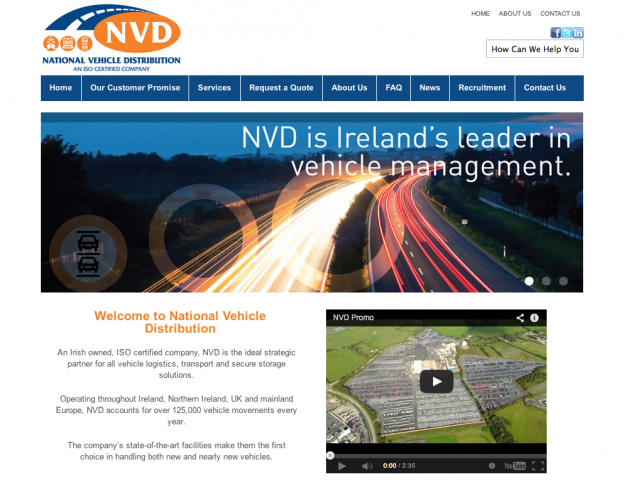 An Irish owned, ISO certified company, NVD is the ideal strategic partner for all vehicle logistics, transport and secure storage solutions. Operating throughout Ireland, Northern Ireland, UK and mainland Europe, NVD accounts for over 125,000 vehicle movements every year. The company’s state-of-the-art facilities make them the first choice in handling both new and nearly new vehicles. We designed and developed the new NVD website to fit the company’s brand identity and showcase the range of services they offer, as well as their attention-to-detail and customer services.